Three of the most significant names in American sports history collide tonight when Army and Notre Dame not only play the fiftieth game in their historic rivalry (for a summary of every game, click here), but do so at Yankee Stadium for the first time in 41 years. When Army first played Notre Dame on November 1, 1913, the game was really more of a warm-up for the upcoming clash with Navy later that month. However, the Westerners, as Notre Dame was labeled in the New York Times’ account of the game, upset the cadets with a revolutionary passing game that took the college football word by surprise. By the end of the afternoon, the Fighting Irish, who were captained by the legendary Knute Rockne, bested Army by a jaw dropping 35-13. Over the next few seasons, the two teams began to develop an emerging rivalry that attracted increasing fan interest. 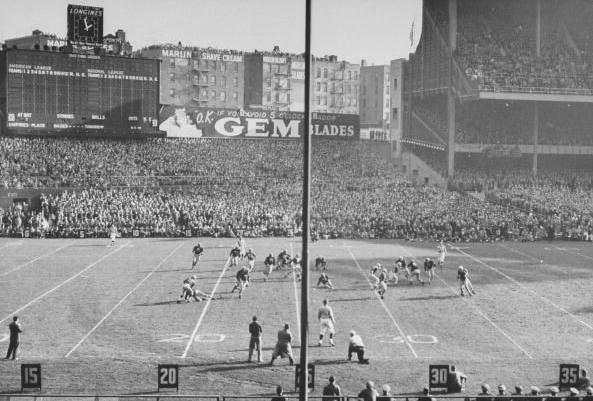 By 1923, both teams had developed into top college programs, and the attendance at their annual matchup necessitated a move to larger stadiums in New York City. Because the Yankees and Giants were playing in the World Series that year, the first new home for the game was Brooklyn’s Ebbets Field. The following year, the two teams laced up at the Polo Ground and then, in 1925, the game moved on to Yankee Stadium, where it found a home for 22 of the next 23 years (in 1930, the game was played at Chicago’s Soldier Field). 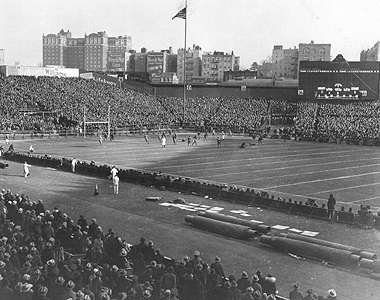 A scene from the first Army vs. Notre Dame game at Yankee Stadium in 1925. A lot of history was made by both teams during the 22-year period when the game was played at Yankee Stadium. In 1928, with the score tied 0-0 at the half, Rockne, now the coach of Notre Dame, gave his historic “win one for the Gipper” speech. The inspirational address spurred the Fighting Irish on to a 12-6 victory, and an American sports legend was born. Although fan interest was always heightened, the rivalry really intensified in the 1940s. Amid the backdrop of a World War, the two teams had emerged as elite, championship caliber programs, and their annual contest had evolved into a national event. From 1943 to 1946, Army and Notre Dame never ranked lower than fifth and at least one of the teams was ranked first in the country. Not surprisingly, the two teams split the four national titles in that span (Army winning in 1944 and 1945, and Notre Dame taking the crown in 1943 and 1946). As Bill Pennington wrote in a retrospective for the New York Times, the Army vs. Notre Dame game became such a big deal that soldiers on the battle front would quiz suspected spies about the score of the most recent game in order to determine if they were really Americans. By 1946, the war had finally come to an end, and soon, so too would the game’s run at Yankee Stadium. Before saying good bye, however, the two teams engaged in what was even then being called the “Game of the Century”. A scene from the "Game of the Century" in 1946. 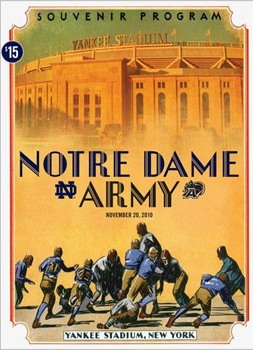 In 1944 and 1945, Army outscored Notre Dame by a combined 107-0. In 1946, however, the game was being played in a new era of optimism. With many of each institutions’ war heroes back at home and in the stands for the game, the anticipation reached an unprecedented level, especially as each team entered the showdown undefeated. Because each team was averaging over 30 points per game, everyone expected a high scoring affair, but instead what occurred was an epic 0-0 tie with new names like Johnny Lujack and Doc Blanchard added to the legend. In 1947, the rivalry moved back on campus in South Bend before taking a 10-year hiatus and then resuming on a more sporadic basis. In 1969, the two teams reconvened at Yankee Stadium for one last time. However, although Notre Dame was still a powerhouse, Army’s program had faded. With Joe Theisman leading the way at QB, the Irish pummeled the Black Knights 45-0 and then closed the curtain on the rivalry’s time in the Bronx. Over forty years later, Notre Dame and Army finally return to the grounds of a new Yankee Stadium. Even though the bloom has faded from both teams’ national profile, the powerful combination of their historic legacies and the rivalry reconvening at Yankee Stadium makes today’s game a highly anticipated event. Yankee Stadium has never been a stranger to legends, so who knows, maybe the echoes will be calling again tonight. Note: Notre Dame leads series 14-5-3 at Yankee Stadium and 37-8-4 overall.